This tutorial takes you through the steps involved in creating a JIRA Event Listener. The above steps will create your plugin skeleton. You can now open this project in an IDE like IntelliJ Idea. The SDK would have automatically created an example plugin component. We will first clean up our directories and delete these files that we do not require. Firstly from your src/main/resources/atlassian-plugin.xml file, remove the following lines. And remember the location from where you are deleting these lines as this is where you will be registering your new plugin module. Delete the files highlighted in the image below. Now it is time to start working on our plugin. 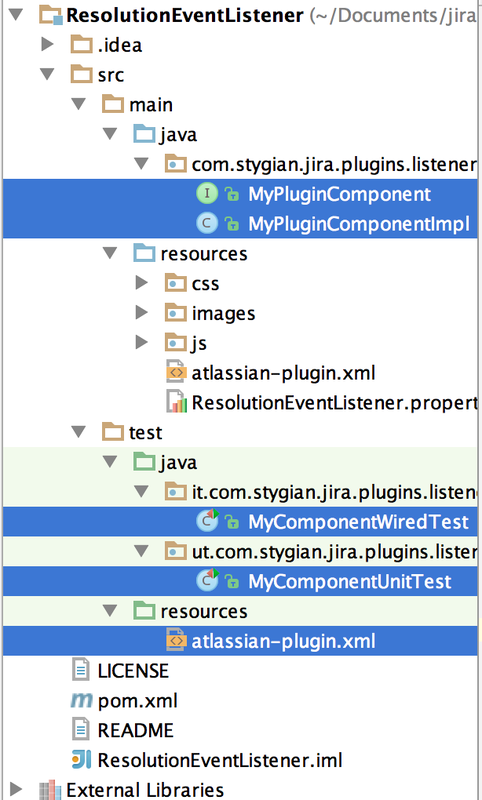 Start by registering your component by adding the following lines to the atlassian-plugin.xml file. I have also added a screenshot to help you figure out where to paste it in the atlassian-plugin.xml file. We will now write a class that will allow us to perform an operation when an issue is resolved. 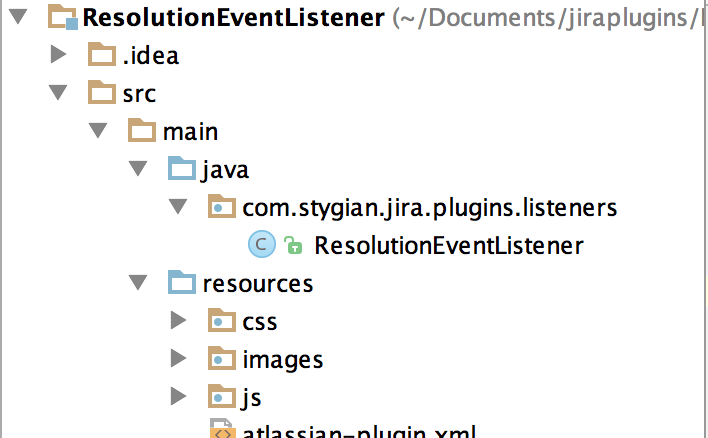 Since our class defined in the above component is com.stygian.jira.plugins.ResolutionEventListener, you will have to create the same folder structure within your src/main/java folder. Take a look at the screenshot below. 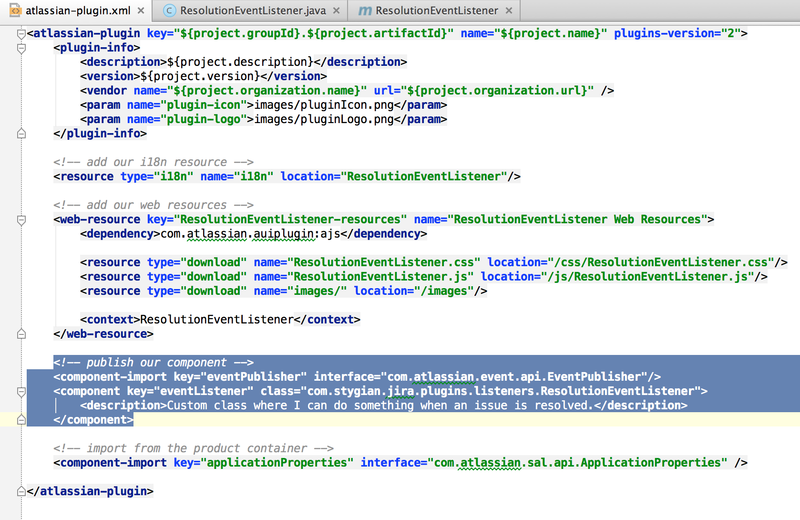 eventPublisher.register(this);    // Demonstration only -- don't do this in real code! Almost there. We just need to make our class implement InitializingBean and DisposableBean. Add the following dependency in your pom.xml within the <dependencies> section. * Called when the plugin has been enabled. * Called when the plugin is being disabled or removed. 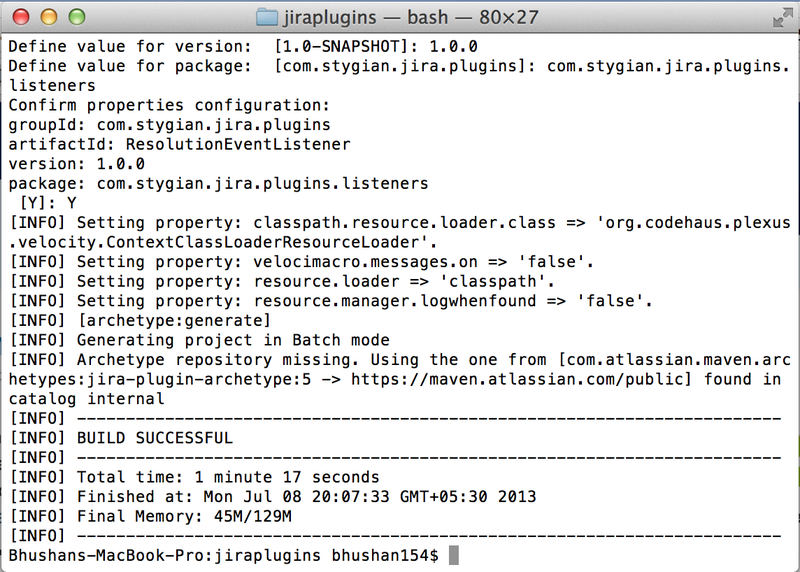 Test your plugin running the atlas-debug command. Access the local instance on http://localhost:2990/jira and login using the username "admin" and password "admin". Go to Administration -> Add Ons and select Manage Add-Ons. You can choose to install a listener upon Jira startup. To do so, create a class that implements com.atlassian.jira.extension.Startable. See example below.